The Australian Kelpie is a medium-sized, athletic herding dog that originated in Australia. Dogs of this breed are extremely intelligent and task-oriented, and are best suited for working on farms or as active pets. Kelpies require moderate maintenance, respond incredibly well to training, and are very healthy overall. They are not suitable for first-time owners or for apartment living. These are medium-sized herding dogs that exist in two subtypes: Working Kelpies, which are varied in size and coat types, and Show Kelpies, which have short double coats in solid colors and are generally heavier than their Working counterparts. Some basic Kelpie information: a typical Kelpie is extremely adept at numerous tasks, be it herding, guarding property, or playing active games--and an absolute nuisance when bored. A side note, Animal Planet does a fun "Dogs 101" for the Australian Kelpie that can provide additional information. One of its greatest attributes is a Kelpie's intelligence. Through the years, these dogs have been taught to manage livestock herds with little or no supervision, so their ingeniousness and problem-solving skills are at an extremely high level for a canine. It goes without saying, then, that a Kelpie will normally respond very well to any training it receives, regardless of difficulty. A Kelpie will be much more at home scampering amongst a herd of sheep than cooped up in an apartment. The way Kelpies herd animals is by running alongside them and nipping at their feet--so new Kelpie owners are surprised when their dogs do the same to children, joggers, even cars! These dogs are much more suited to the open outdoors than inside; the same new Kelpie owner will leave the dog home alone, only to return and find his apartment in shambles. Physically, a typical Kelpie is absolutely tireless. While not overly strong, this breed has incredible stamina, and will make a great jogging companion. So naturally, a Kelpie will need a great deal of exercise! Australian Kelpie history begins, of course, in Australia--though the Kelpie's origin (and its name) can be traced back to Scotland. 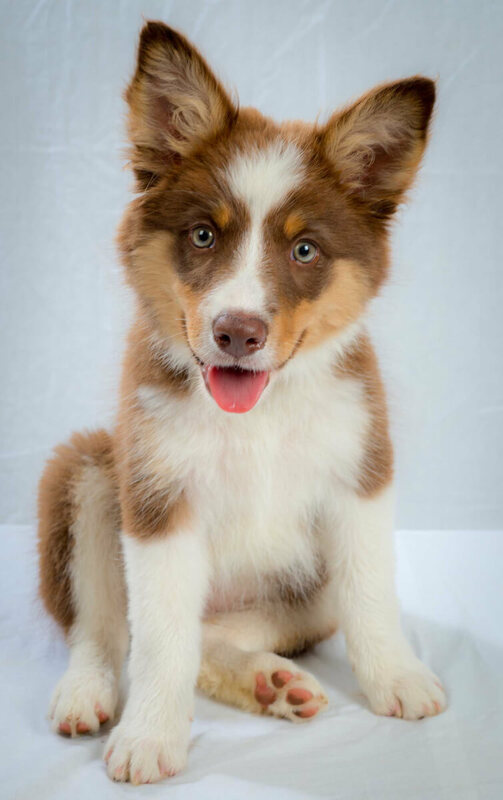 In the early nineteenth century, Australian farmers began importing Collies from Scotland and Britain because of the breed's great reputation for herding livestock. As the years passed, the farmers began crossbreeding the Collies with other dogs (and even the occasional Dingo), supposedly to develop a breed that would be able to supervise livestock with little supervision. This crossbreeding continued for several decades, until in the 1870s a Scottish man named George Robertson sold a black and tan pup named Kelpie to a man named Jack Gleeson--and this is supposedly where the Australian Kelpie breed lineage begins. Accounts vary as to whether Robertson or Gleason named the dog; a "Kelpie" is also the name of a legendary magical water creature that was said to inhabit the lochs in Scotland. In any case, the name stuck, and the original Kelpie dog (later known as "Gleeson's Kelpie") produced offspring known as Kelpie's Pups (or simply Kelpies) that excelled in Australian dog trials in the late nineteenth and early twentieth centuries. By the early 1900s, the Kelpie breed was firmly established across Australia, and as the breed was exported to other nations in Europe and North America during the twentieth century, it became known as the Australian Kelpie. One of the earliest Kelpies was an all-black dog named Barb (called so after a famous Australian racehorse); hence, all the black dogs of this breed are referred to as Barb Kelpies. 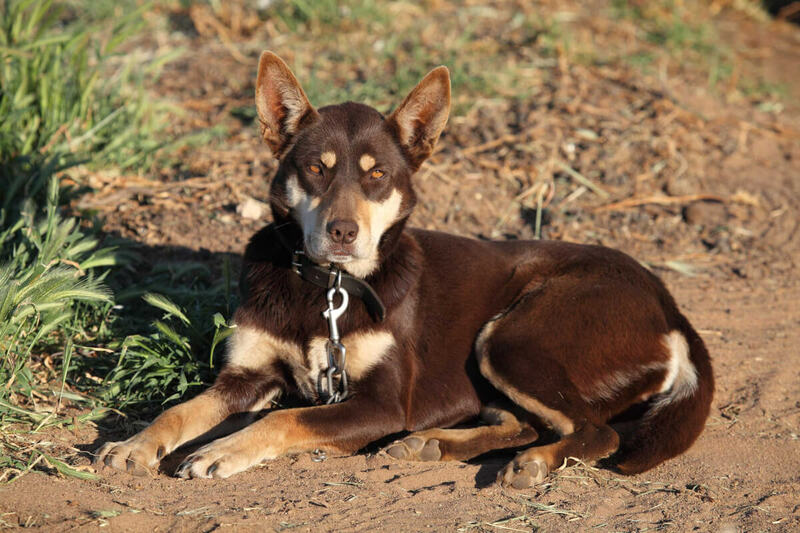 Another famous moniker in Australia is Red Cloud Kelpies, which describes dogs that are reddish or brown; supposedly the "red cloud" refers to the dust produced in the arid Western Australian regions. The Australian Kelpie is medium-sized, athletic, and streamlined in appearance. 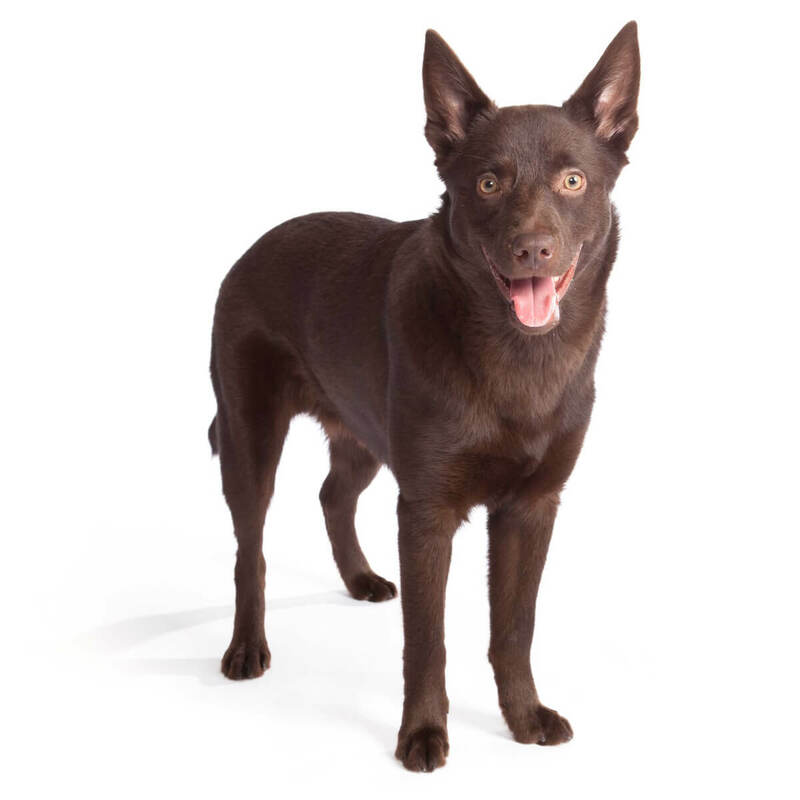 Scientists have determined that this breed's genes contain a small percentage of DNA of the Dingo, and this is undoubtedly apparent in a Kelpie's lithe, contoured anatomy. A typical Kelpie's overall build is compact and muscular, and its body is normally a bit greater in length than in height. The large head is wedge-shaped, the muzzle is quite long, and the jaws are powerful. A Kelpie's eyes are medium-sized and almond-shaped; the eyes are normally brown, though a Kelpie with blue eyes is not uncommon. Kelpie ears are fairly long and erect. The tail is fairly long and curved slightly. The Kelpie normally has a short- to medium-length double coat, consisting of a dense undercoat and a straight, waterproof outer coat. Australian Kelpies exist in a variety of colors. The coats can be either solid in color, or have a dark primary color with patches of a lighter color like tan or white on the dog's lower body. 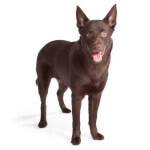 Australian Kelpie size is fairly standard, and doesn't vary a great deal from dog to dog. Kelpie weight is typically 30-60 pounds, while height at the shoulders is 18-22 inches. Working Kelpies have some variance in size, and are built more for that for which they're named--work. 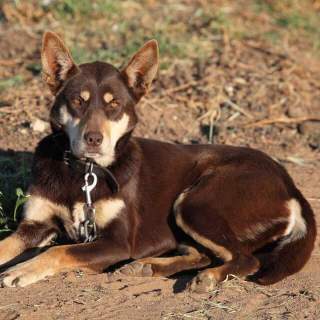 This Kelpie variety can have short- to medium-length, smooth or rough coats, and the coats are usually double-layered. These dogs display a variety of both solid and multiple coat colors as well. Show Kelpies are usually shorter and heavier than the Working variety; their muscles normally aren't as defined as Working Kelpies, who spend hours toiling in the fields. This variant typically has a short, smooth coat that exists only in solid colors. In both variants, a smooth, double-layered coat is most common. The coat can be short or medium in length, and a rough texture is possible; a long-haired Kelpie is quite rare. The Miniature Kelpie--about 16 inches in height, 30 pounds in weight--does exist, but is rare; it is unclear whether a small/Mini Kelpie is a specific subtype of the breed, or is simply a deviation from normal Kelpie size. Intelligent, alert, active, and extremely independent, the typical Australian Kelpie temperament is that of industriousness and enthusiasm. These dogs have been developed to think for themselves while performing tasks, so a Kelpie will undoubtedly have a mind of its own--which is usually a very good thing, because this breed can understand and accomplish quite a lot for a canine. Kelpies are normally fairly standoffish, and are suspicious of nearly anything unknown to them, so plenty of socialization with humans and other pets, starting when the dog is a puppy if possible, is highly recommended. 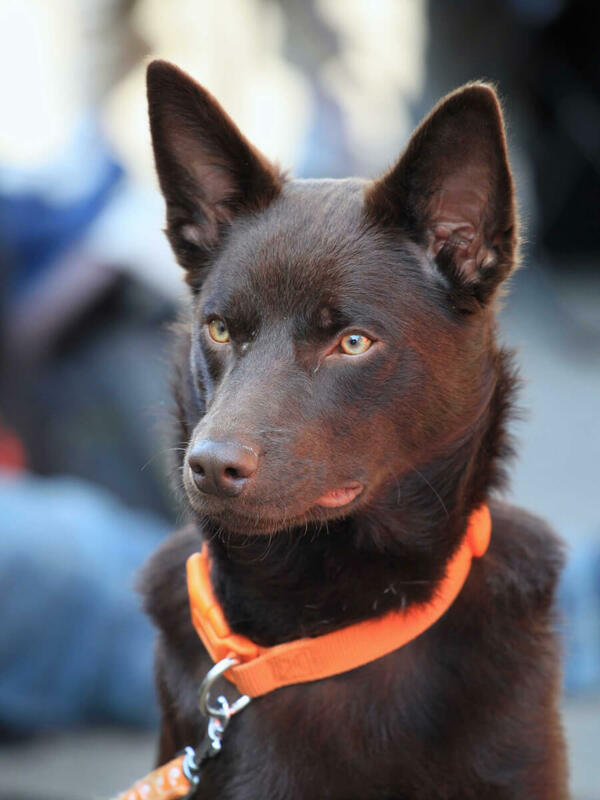 When it comes to training, typical Kelpie traits and characteristics are virtually unmatched. Dogs of this breed can learn even complex tasks with very few and once the owner sees that the Kelpie understands that task or command it's being taught--move on to another! The Kelpie will remember what it's learned, without a doubt. The Kelpie personality also makes the breed a fantastic watchdog. Since a Kelpie's instincts make it suspicious of unknown sights and sounds, a Kelpie will undoubtedly bark loudly when confronted with a potential threat. These dogs socialize well with human families, especially if they are raised within a household from puppyhood. If a baby Kelpie grows up around kids and other pets, it will learn to treat them with respect and affection. And let it be said that an adolescent Kelpie makes for an utterly fantastic playmate! Keep in mind, though, that these dogs are instinctively task-oriented, and will need nearly constant activities that keep them physically and mentally engaged. Kelpies do not make good "always inside" pets; they're better suited for homes with outdoor space--and they'll prefer the outdoor space a majority of the time. Since these dogs are a herding breed, their instincts are to listen to the "herding master," so a Kelpie often devotes most of its attention to the one family member who teaches or trains it most; this person, the dog believes, is its master. Below are pictures and images of the Australian Kelpie. People considering having Kelpies as pets purely for companionship might want to find another breed. These canines are entirely unsuited to being lapdogs! Kelpies, by instinct, need a job to do, so they will work best as farm dogs; if you insist on having a Kelpie as a pet, make sure to provide plenty of exercise, tasks for the dog to fulfill (like fetching the daily newspaper), and room to run. Because one thing is certain: a bored Kelpie will be a destructive one. It's best if dogs of this breed have a large outdoor area in which to roam, and it's even better if they have a flock to manage while doing so. Apartments and Kelpies are a terrible match; not only will the dog need plenty of daily outdoor exercise, but it will turn destructive if left alone. Kelpies shed moderately--but heavily during shedding season. They're not hypoallergenic, so for allergy sufferers, owning a Kelpie is not a good idea. Australian Kelpies are extremely healthy overall (often living up to 13 years), but may suffer joint and bone issues like hip dysplasia, patellar luxation, and osteoarthritis. A few Kelpies may inherit neurological disorders including Collie eye anomaly, progressive retinal atrophy (PRA), or a rare condition called cerebellar abiotrophy (a nerve condition that affects balance and coordination). 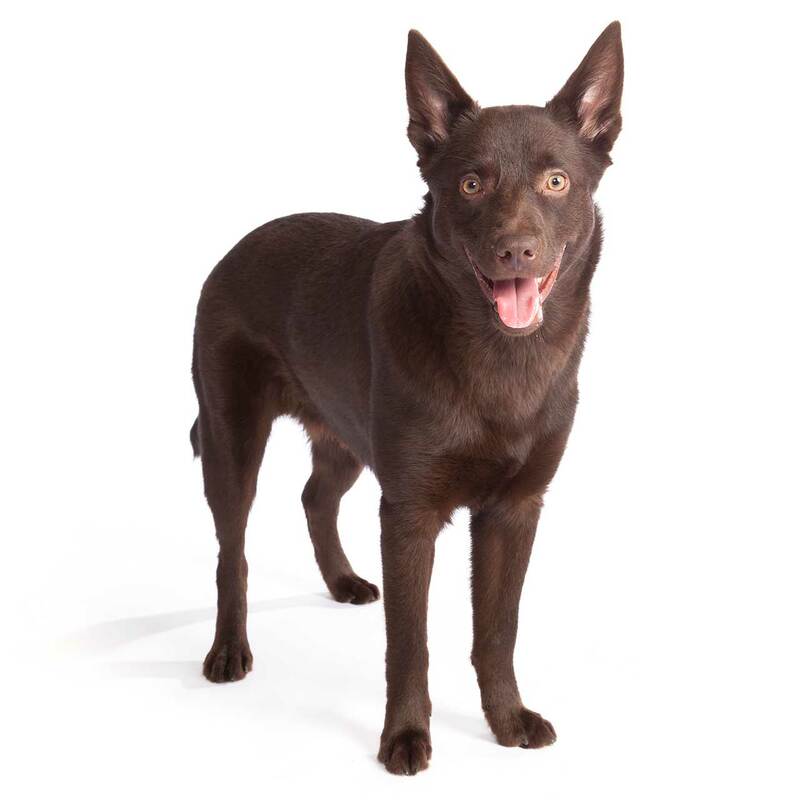 To minimize the possibility of your Kelpie developing these disorders, make sure to obtain your dog from a respectable breeder/owner who will discuss these conditions prior to your bringing the dog home.